Well I did it. I've found my favorite shrimp recipe to date. 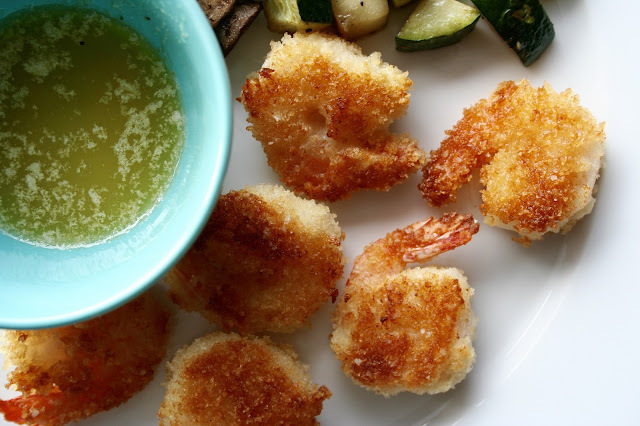 These baked "fried' shrimp are so good you'll never want to order them at a restaurant again. It could be the panko crumb coating that makes them so great or it could definitely be the garlic butter dipping sauce, but one thing I know for sure is you will love these! They take a second to dip into flour, egg whites and a panko mixture, but they are so worth it. And might I suggest serving them alongside some chopped zucchini and mushrooms that have been sautéed in a little butter? This is seriously my new favorite meal and it's perfect for summer! 1. Preheat oven to 475F. 2. Pour olive oil in a rimmed baking sheet/pan and spread around to cover the bottom of the pan. Set aside. 3. In a bowl, combine flour and 1 tsp. salt; mix to combine. 4. Pour the egg whites in a separate bowl and beat lightly. 5. 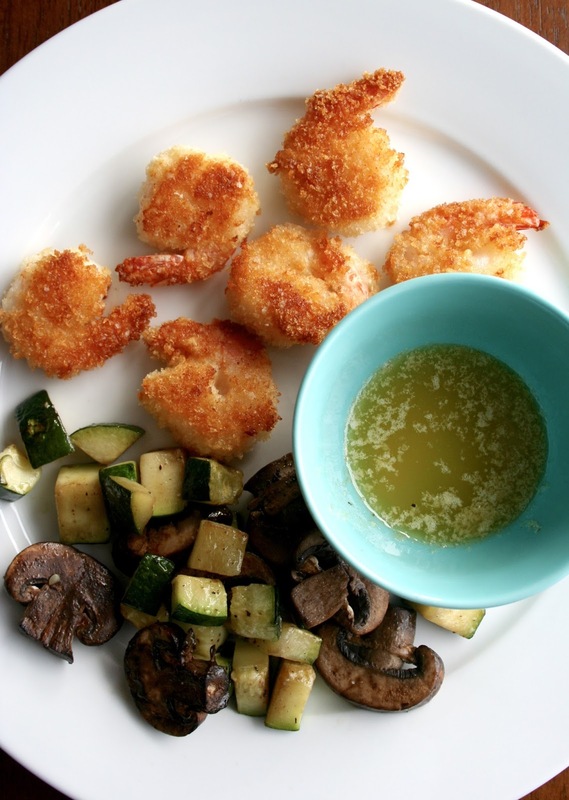 In a third bowl, combine panko crumbs, 1 tsp. salt and cayenne pepper; mix until well incorporated. 7. Transfer shrimp to previously prepared pan and evenly spray each shrimp with cooking spray. 8. Bake for 7 minutes; turn over and continue to bake for 5 to 6 minutes, or until golden brown. Remove from oven and serve. 1. Melt butter in a saucepan or microwave. When completely melted, remove from heat or microwave and let stand about 20 seconds. Whisk in garlic powder and salt. 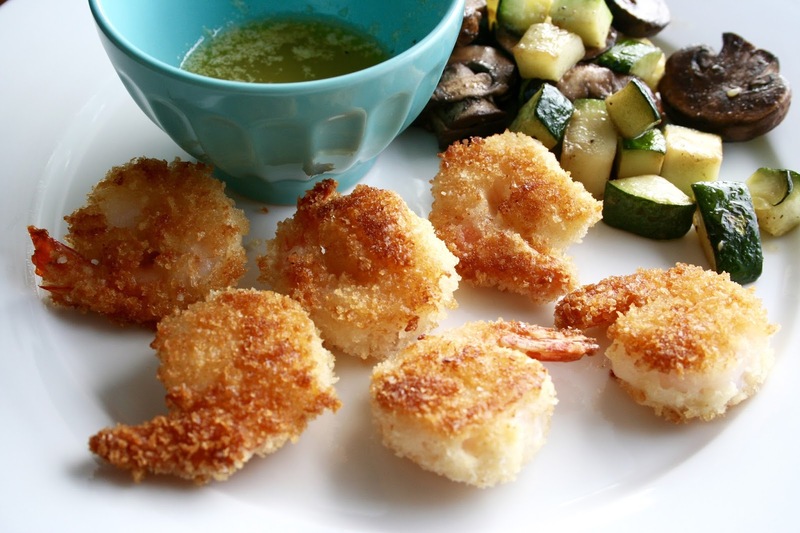 Transfer to a serving bowl and serve with the prepared shrimp.